Picture the scene: It’s a night at the very beginning of man’s history. A cave with a fire at the entrance, orange flames casting a flickering light. Wood crackling and smoke twisting. 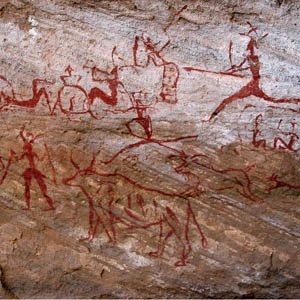 Further back in the cave, a group of young hunters, clad only in animal skins, form a half circle around a painting of animals on the wall. The oldest among them, Reg, is speaking; “Right lads, today we is talking about the wind – got it?” Blank faces stared back at him. Reg points at the picture; “Look, it’s quite simple – 8 out of every 10 attacks against the wind direction result in a successful hunt, whereas 90% of attacks with the wind behind you results in nothing” He points again – “See, wind…animal…you.” The circle of faces gradually gain comprehension with many nods and toothless grins and Reg knew the hunts would be more successful from now on. The villagers huddled in the cold stone church listening to the priest droning on – when could they get back to their warm homes, their crops, their fornicating? The priest suddenly became very loud; “If thou should do good – thou shall get to Heaven – a wonderful glorious place, but if thou commit sins and follow the path of evil, it’s down into the darkness of Hell you shall go!” The villagers seemed unimpressed. Right, thought the priest; “Look, it’s quite simple – see that stained glass window there” he pointed to a bright colourful window where the sun was streaming in and choirs of haloed angels with impossibly angelic faces played harps; “That’s heaven that is.” The congregation were paying attention now – and several “Ooohs!” could be heard. 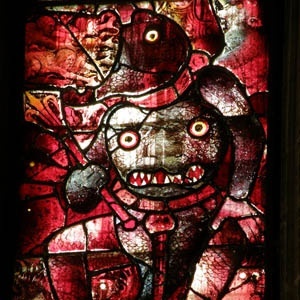 “And that window,” the priest continued, “That’s Hell that is.” The congregation turned and looked; “AAAAARRRGGGHHHH!”, and there was much wailing and gnashing of teeth. “Ah Mr Medici, I er, wondered if you might ‘ave a second sir?” Leonardo entreated as he plucked at the Master’s tunic. “It’s not a painting” Leonardo assured him. “I want to build an ornithopter” Leornado said, eyes pointing heavenwards. “A horny what?” Lorenzo queried. 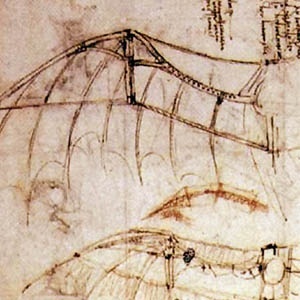 “An ornithopter – a winged machine” Leonardo tried to explain. Throughout history images have played a powerful part in transmitting ideas quickly, some of which, like Leonardo’s ornithopter, are very difficult to describe in words. Today infographics have become the latest form of imagery to become popular, with thousands in blogs, presentations and news articles across the web. They have become one of the main ways to attract attention, gain search results and get shared. So using images in the inbound marketing mix means you'll get your point across quicker, and it is more likely to be remembered. Speed is of the essence in business communication as most web users make decisions about staying on a web site (or blog) within a few seconds of landing on the page. Seasoned web users learn to speed read and skim pages, so here images are essential to convey a quick confirmation that they are in the right place (logo or header graphics), that there is something interesting and appealing to see (an engaging image), and there is good content (an infographic or diagram). Appeal is also important, many people are visual learners and find images more interesting to look at than words. No matter how well written a blog post is, most people would balk at screen upon screen of just words. The infographic in particular has become popular as a means of conveying, often quite complex information, quickly. And consider sharing; to share a text article you would either have to copy the whole article – which is plagiarism – rewrite it, which is time consuming – or summarise it’s most important points – possibly even more time consuming than rewriting it. Whereas sharing an infographic takes a second, it carries all its information with it (including branding, contact details and call to action) and it can be shared almost anywhere and through almost any social media channel. Infographics (along with videos) are currently the most likely content to go viral in the business world. So using images in your blog posts, web sites and social media is not an option – it’s a necessity. Almost every social media site is now focussed around images and video. Even Twitter is now all about the image or the video. Posts without visual content are just getting lost in the stream. That’s not to say that words have no place in conveying an idea or communicating a message, just that they take longer to take in and comprehend. Imagery is essential to attract attention and convey a message almost instantly; once the browser has noticed your post you can then convert them into a reader. Words are good at conveying abstract ideas, evoking emotions and telling stories. The first three stories in this blog post would be difficult to tell in pictures, but even here, though I have used words, I’ve used those words to paint a picture in your head. It is always powerful if you can visualise a message, an idea or a concept by telling a story that creates scenes in reader’s heads. We rightly think about our writing in inbound marketing and blogging a great deal, but never forget to employ the power of images to attract people to your post and to communicate quickly and effectively.